VALDOSTA — Valdosta State University’s College of Nursing and Health Sciences announces the opening of the new, state-of-the-art Center for Exercise Medicine and Rehabilitation. 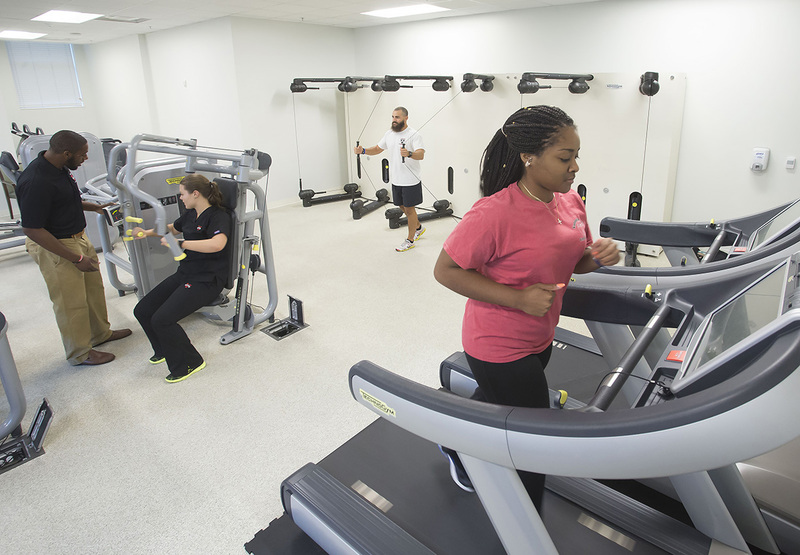 Located on the first floor of the Health Sciences and Business Administration Building, the Center for Exercise Medicine and Rehabilitation is operated by the School of Health Sciences’ Bachelor of Science in Athletic Training Program and Bachelor of Science in Exercise Physiology Program. Its mission is “to educate and train students while fostering an avenue for faculty practice and supervision through the delivery of select primary, secondary, and tertiary services for students and employees of the university, local municipalities, industry, and citizenry,” shared Dr. LaGary Carter, associate dean of health sciences and associate professor of exercise physiology at VSU. Its vision is “to be recognized as a service model for institutions in the University System of Georgia based on a demonstrable commitment to civility, integrity, and citizenship,” he added. Offering the full spectrum of cost-effective care, the faculty, staff, and students of the Center for Exercise Medicine and Rehabilitation’s Athletic Training Clinic are prepared to meet the rehabilitation, treatment, and injury prevention needs of clients of all ages, from children to adults. Services available include a variety of therapeutic techniques designed to improve range of motion, flexibility, and strength and promote healing; AlterG: Antigravity Treadmill sessions for pain-free physical therapy and training; Biodex Multi-Joint System Pro sessions for testing muscular imbalances, aiding in rehabilitation, and helping prevent injuries; and Biodex Balance SD for Baseline / Post-Concussion Testing, which helps athletes stay safe around the clock by ensuring they do not return to play until it is safe to do so. Younker plans to pursue additional athletic training instruction at the graduate level after graduation. Her dream is to work with high school athletes. She was part of the Colquitt County High School athletic training team when the Packers won the state championship in 2014. The Center for Exercise Medicine and Rehabilitation’s Fitness and Wellness Clinic offers adult clients the full spectrum of cost-effective care, including continuous supervision by a well-trained and knowledgeable staff; a safe and healthy fitness environment featuring Technogym treadmills, recumbent bikes, elliptical trainers, stationary bikes, resistance training machines, and Kinesis One stations; individualized exercise prescriptions; online diet, activity, and overall wellness tracking through Wellsource; and clean and private restroom and shower facilities. Monthly membership fees include exercise prescription, exercise supervision, and health education for both apparently healthy individuals, as well as those who are at risk of having cardiovascular, pulmonary, or metabolic disease. An initial assessment is conducted on all new clients to determine their personal wellness profile, muscular fitness, body composition, flexibility, and more. Those who require additional testing not offered in the Center for Exercise Medicine and Rehabilitation’s Fitness and Wellness Clinic will be referred to VSU’s Human Performance Lab. Located on the second floor of the Health Sciences and Business Administration Building, this lab houses such equipment as the Cosmed Bod Pod, which determines body composition; the Hologic Discovery DXA scanner, which features bone densitometry technology that allows clinicians to assess bone health in patients who may be at risk for osteoporosis or fractures; and the Biodex System 4 Pro, which helps clinicians identify, treat, and document physical impairments that cause functional limitations. Appointments may be scheduled by calling (229) 333-5959. VSU’s Health Sciences and Business Administration Building is located at 2525 N. Patterson St., across the street from South Georgia Medical Center. Contact Sean Hutchison, clinical instructor for the Bachelor of Science in Athletic Training Program, at swhutchison@valdosta.edu or Sarah Fretti Thomas, director and instructor in the Bachelor of Science in Exercise Physiology Program, at skfretti@valdosta.edu to learn more. Goal 5: Develop and enhance Valdosta State’s human and physical resources.